The Bag-in-Box systems are available in three sizes: 3,5 and 10 litres. The juice storage bags can also be purchased separately without a box. There is no need for a separate filling system to fill the juice bags; however, the bag holder may be helpful. By clicking on 'Read More' button, you can see more information about Bag-in-Box system. Bag-in-Box is an excellent replacement for bottles and jars! It is very popular to store apple juice in 3-litre jars. This involves washing, heating and canning the jars. Big jars take up a lot of space, are heavy and can easily break. Once the jar is opened, the juice should be consumed within a few days so that it does not ferment. When the juice is consumed the jars should be washed and stored again until autumn. As there are less jars circulating, it is harder to find new ones. This problem is solved by Bag-in-Box system. The outer carton box is protection for a plastic juice bag inside of it. For consuming the juice, there is a tap at the bottom of the bag. 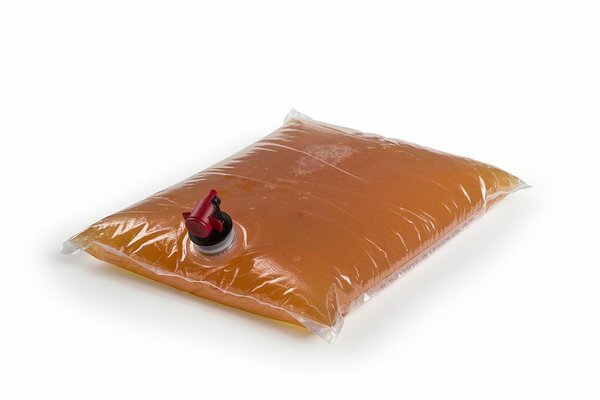 The bag squeezes in by vacuum when the juice is being consumed though the tap. The oxygen can not reach the juice through the sealed tap and double layered bag. Once you open the tap, the juice remains fresh for about 2 to 3 months, that is significantly longer than in the jar. The juice bags should be filled with a juice that is heated to about 78-80°C degrees. Boiling the apple juice is unnecessary, since already at about 78°C all yeast and fermentation cells in juice are destroyed. To fill the bag, remove the tap that can be easily pulled out of the bag. The filling of the bag is carried out through a 30mm diameter hole in the bottom part of the bag (where the tap was previously pulled out). Filling process is easier when using the bag holder and funnel. After filling, let out all excess air that is still in the bag and insert the tap back to its place. Leave the filled and sealed bags to the rest with the tap upwards until they have cooled down to 35°C degrees. Once the juice bags are cooled down, place the bag inside of the boxes. Now the juice can be stored for at least a year at room temperature. The bags can also be stored without a box, maximum two layers on top of each other. The bags without boxes must be protected from direct light.